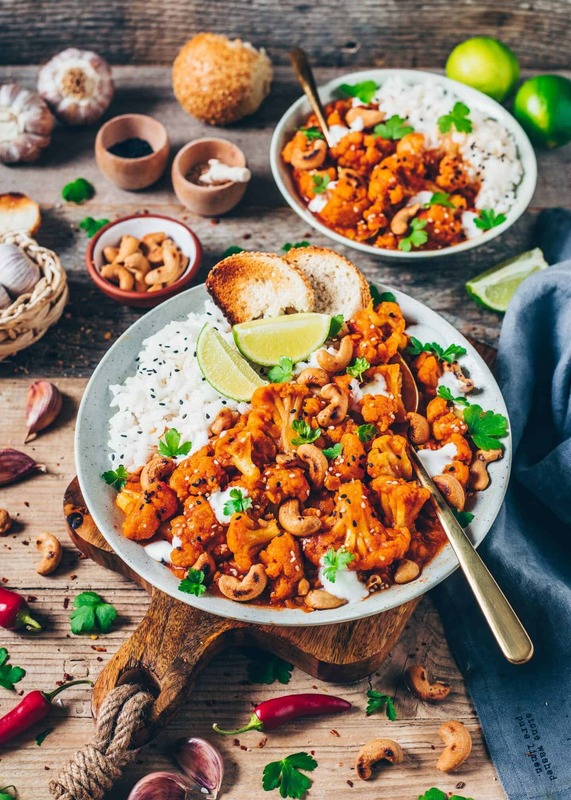 This Vegan Cauliflower Tikka Masala Curry is packed with flavor, protein from red lentils, and maybe best of all, it comes together in less than 20 minutes in one pot! Making this a delicious, healthy and gluten-free lunch or dinner that’s super easy to make. A creamy and flavorful vegan Curry is just one of those meals that everyone loves and can be cooked anytime. It’s super easy to prepare and always perfect when you’re in need of a simple and comforting meal. The combination of different spices, healthy vegetables, and that creamy texture are a perfect match! 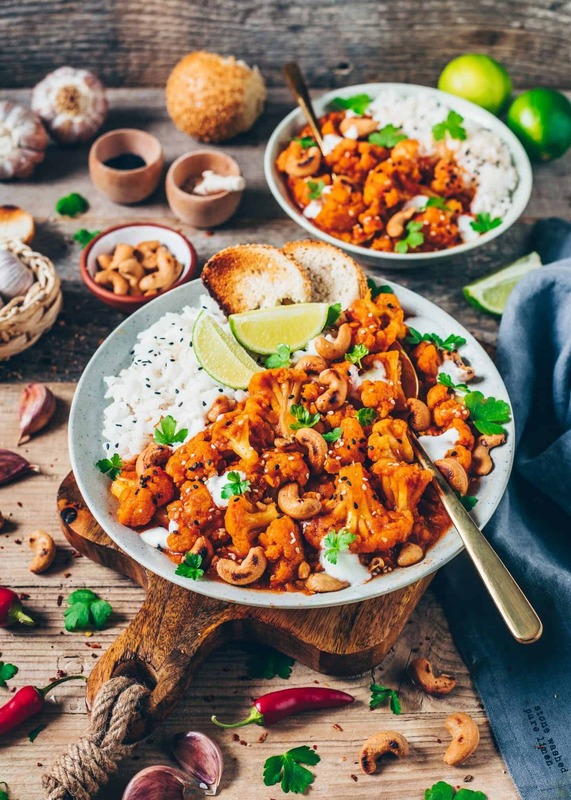 And if you’re not a big fan of cauliflower or don’t know how to prepare it in a delicious and flavorful way, you should definitely try this Cauliflower Tikka Masala Curry! For more Cauliflower Recipes you can also check out my crispy Cauliflower Nuggets or my BBQ Cauliflower Wings. Since I also love Indian dishes, such as my Indian Lentil Dal, today I’m sharing with you another Indian inspired recipe – Cauliflower Tikka Masala Curry. Some of you may have already heard of this delicious dish because it’s very popular in Indian cuisine. While the traditional Tikka Masala is made with Chicken (or in the vegetarian version with the Indian cheese “Paneer”), I made mine with Cauliflower. This not only makes it meat-free and vegan but also MUCH healthier and lower in calories and fat. Instead of using a lot of heavy cream, paneer (cheese) and butter or oil (which you’ll find often in the traditional Tikka Masala), I used only crushed tomatoes, vegetable broth and lentils to make the vegan curry sauce. To serve, I added some non-dairy yogurt. However, coconut milk, dairy-free cream cheese or homemade cashew cream is a great option to create a creamier texture too. 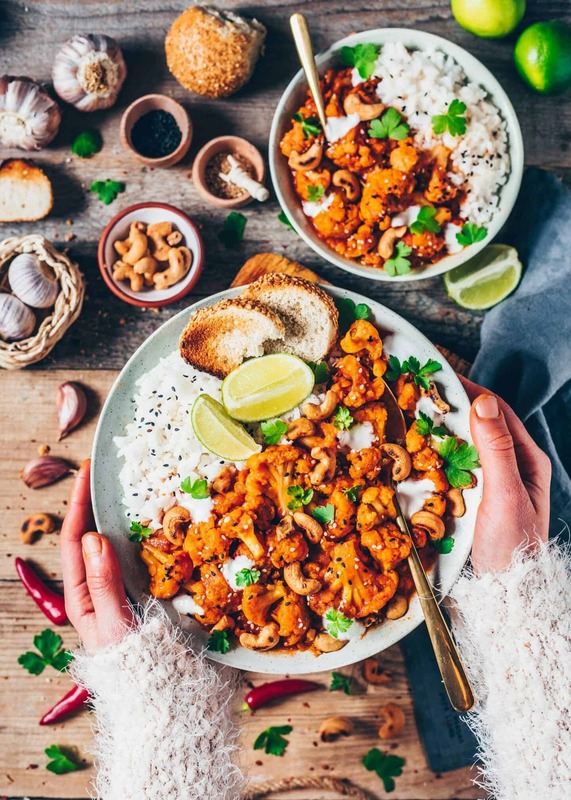 To make a simple cashew cream, just blend 1/3 cup raw cashews (preferably soaked in water overnight or only 20 minutes when using HOT water) with 1/4 cup water until smooth and creamy. To add some protein, I used red lentils, which are a perfect addition to the Cauliflower Tikka Masala Curry Sauce. Not only because they contain healthy nutrients and plant-based protein, but also because they make a thicker texture. I don’t know about you, but I personally always prefer a creamy, rich and thick sauce instead of a watery sauce which reminds me of a soup. 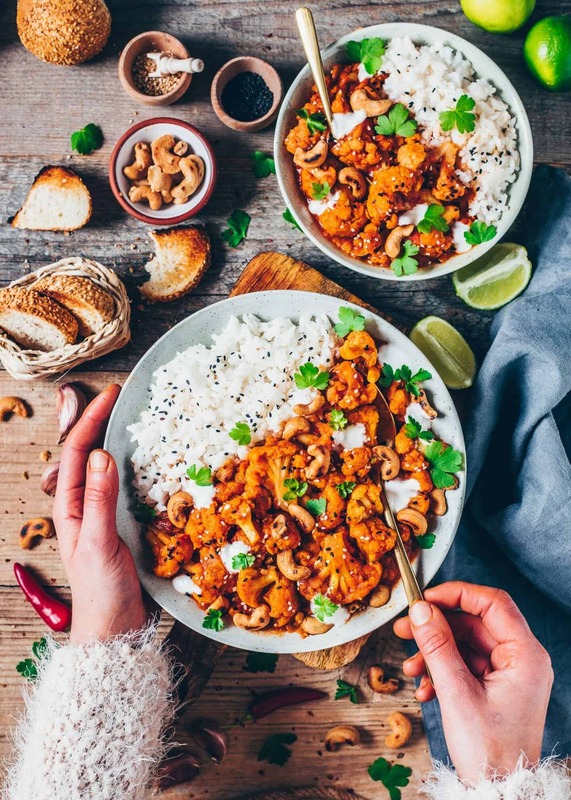 Anyways, you can mix up this Indian Curry by substituting chickpeas, beans or peas or adding other vegetables like sweet potato, pumpkin, zucchini, carrots, bell pepper or other. Just make sure not to add all of the vegetable broth if you omit the lentils and sub canned chickpeas. Otherwise, the Tikka Masala Sauce will probably get too soupy. Easy to make in less than 20 minutes! You can serve this Indian Curry with rice and a piece of toasted baguette, like I often do, or serve it over mashed potatoes, creamy polenta or with naan, flatbread or your favorite tortilla. As mentioned before, it’s truly SUPER QUICK & EASY to make, so you’ve got a hearty healthy dinner on the table fast. 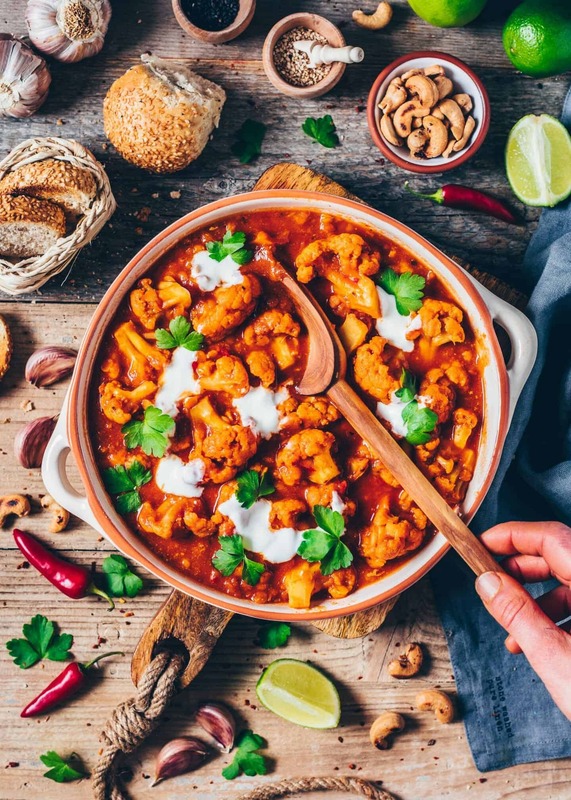 For more curry dishes, be sure to check out my Pumpkin Chickpea Curry, Indian Chickpea Curry, Indian Lentil Dal or Chili sin Carne. 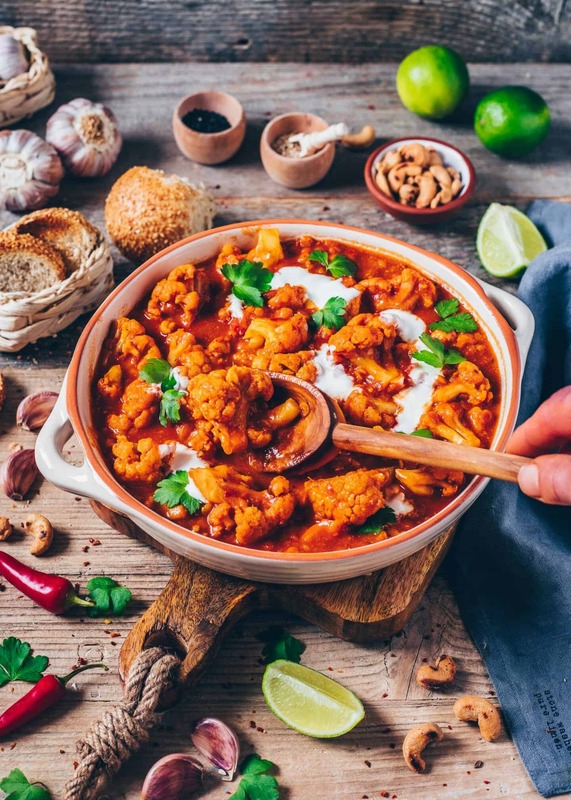 And if you give this Cauliflower Tikka Masala Curry recipe a try, let me know in the comments here and by tagging me @biancazapatka on Instagram! 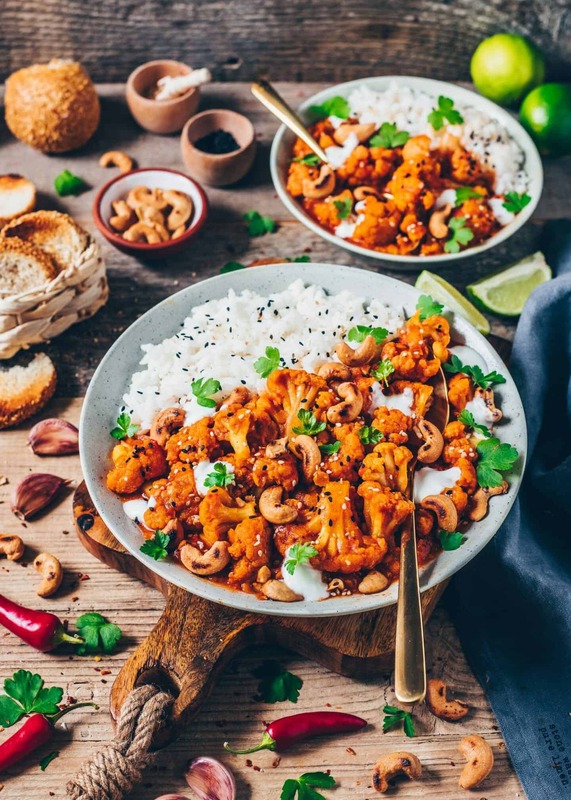 This Vegan Cauliflower Tikka Masala Curry is packed with flavor, protein from red lentils and comes together in less than 20 minutes in one pot! It makes a healthy dinner or lunch which is delicious, gluten-free and very easy to make. In a large pan, heat the oil on medium-high heat. Add the cauliflower florets and onions. Sauté until they are starting to brown and onions are translucent, about 3 minutes. Add the garlic, ginger, lentils and spices. Sauté for a further minute until fragrant, stirring constantly. Add the crushed tomatoes and vegetable broth. Stir to combine and cook covered for about 10-15 minutes on medium-low heat until the cauliflower is tender and the lentils are cooked through, stirring occasionally. Add more water to thin (if needed) or coconut cream/ cashew cream* (to make it creamier). If the sauce is too watery, cook again uncovered for a further few minutes until it thickens to your desired consistency. Season with additional salt and spices, if needed. Serve with non-dairy yogurt over rice (or mashed potatoes, creamy polenta) and with your favorite bread. Garnish with sesame, roasted cashews* and fresh parsley, if you prefer. 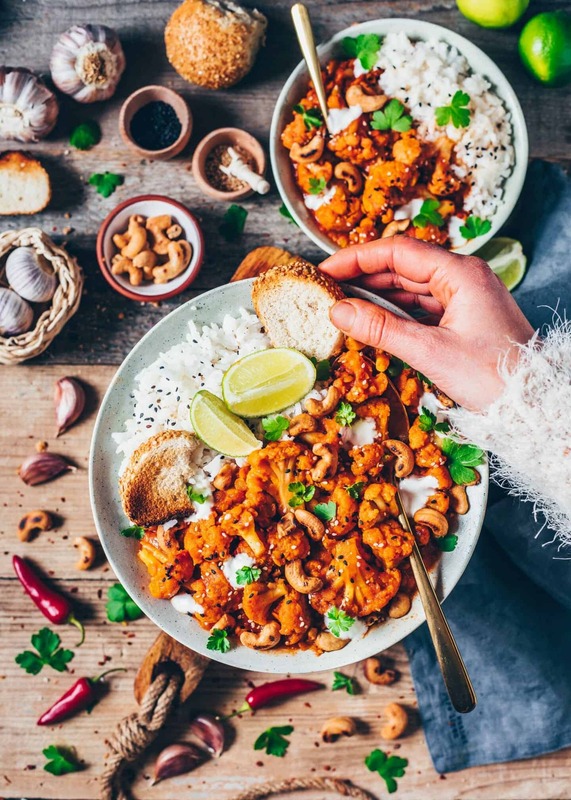 To make the cashew cream, just blend 1/3 cup raw cashews (preferably soaked in water overnight or only 20 minutes when using HOT water) with 1/4 cup water until smooth and creamy. You can sub and add other vegetables or chickpeas, peas, beans (read suggestions in the text above). Just make sure not to add all of the vegetable broth if you omit the lentils and sub canned chickpeas. Otherwise, the sauce will probably get too soupy. To make roasted Cashews, add raw unsalted cashews into a hot pan without additional oil and roast from all sides until lightly browned, about 2-3 minutes. This one is absolutely amazing and so easy to make! Try it. Taste it. Love it!!! This curry is delicious and easy to make.